Who would benefit from seeing this play? General audiences, and especially those involved in higher education, the arts, science, technology, medicine, and businesses and organizations dealing with creativity, invention, and innovation. What should you expect to see? This is a one-hour, solo performance, with period costume, music and slides. The play is half biographical and half focused on Leonardo’s art, science, inventions, and research. There are tragic, comic, risque, and inspiring elements to the play. At the end of the performance, Dr. Weiner is available for questions and discussion about Leonardo. What is the significance of this performance? While Leonardo is widely regarded as the single greatest creative individual in Western history, few of us have learned much about him because of the departmental divisions of our universities and the specialization in our workplaces. 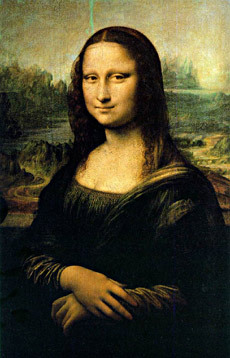 And yet, we all admire Leonardo’s creativity, and we can and should learn from his extraordinary example. That is the reason for this Visit With Leonardo da Vinci. How true to life is the performance? The play is faithful to what is known about Leonardo. Many parts of the play come directly from Leonardo’s notebooks, drawings and paintings, or from scholarly research. The performance is, however, theatrical — a 21st century invention, made for 21st century audiences. How educational is the performance? The theatre-piece is supplemented by a Leonardo Study Guide (with chronology, map, and bibliography), available to educational institutions for duplication, and by a post-performance question and discussion session with Dr. Weiner. Academically, the performance addresses several disciplines: Renaissance Italy; the History of Art; the History of Science, Technology and Medicine; Class and Gender issues; Interdisciplinary Thinking; The Creative Process; and Education. What will appeal to corporate and professional audiences? Leonardo is an extraordinary example for creativity. Leonardo’s numerous insights and innovations in several scientific, technical, and artistic fields; Leonardo’s struggle to overcome obstacles and achieve greatness; and especially, Leonardo’s remarkable problem-solving and creative-inventive process, involving analogous, lateral thinking, and the repetition of insights and techniques from field to field, should all prove thought-provoking and inspirational to professional and business audiences. What are Dr. Weiner’s credentials for this performance? Rob Weiner has taught college for twenty years, written a scholarly book on creativity and culture, and created a visit with Leonardo da Vinci, as well as the Study Guide which accompanies it. Rob had unique exposure to theater as a child, has taught oral presentation, sings and dances, and has performed Leonardo around the country. For further details about Rob’s biography, see About Dr. Weiner, and for information about his other projects, see the website, creativityandbeyond.com. 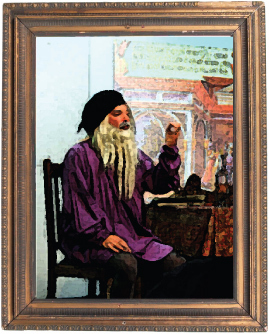 Where has a Visit With Leonardo been performed?At public theaters, at colleges and universities, community centers, high schools, art galleries, and professional conferences. How much does Leonardo-live cost? $700 – $2500, plus travel expenses, depending on size of organization. Stage area minimum: 12’ x12’, with easy access between stage area and audience seating. Note: Because this is a traveling, solo performance, Leonardo relies on your organization to help with the production. Ideally, you will provide one assistant to control the music during the play and one assistant to control the projection (in addition to stage setting).Each assistant receives a script to follow and some basic instructions. Since we will normally not have time to rehearse together beforehand, Leonardo may prompt the assistants in the course of the play, if it is necessary (the prompts fit more or less seamlessly into the play). 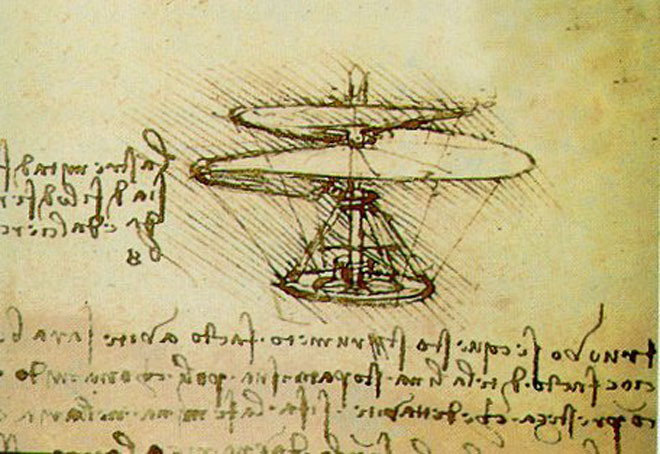 Leonardo was a pretty inventive person, and if these ideal conditions can’t be met, he will do his best to improvise.